You are here: Home » Most Important Journalist » You are Responsible Now. You Ready? You are Responsible Now. You Ready? 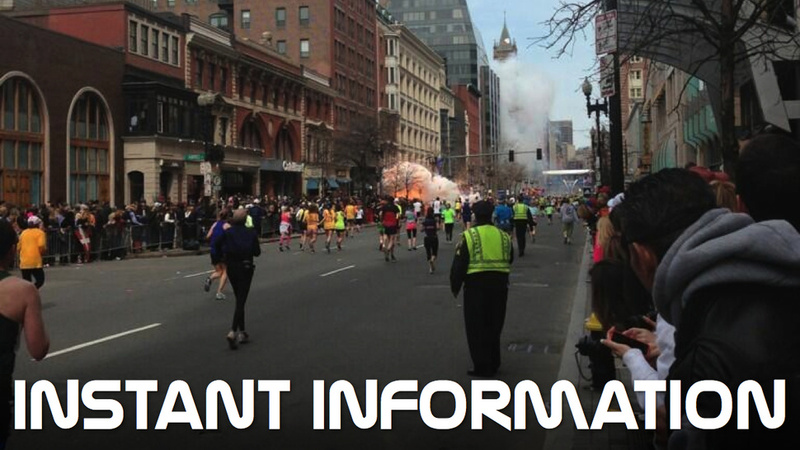 The Boston Marathon Bombing made us realize we are both news consumers and news providers. Welcome to your new job and your new role as an American Citizen in the 21st Century. As horrific as the hours were from the bombs explosions until the capture of the supect, it was also enlightening for me to be “live blogging” with many of you who were monitoring other sources of news. In my Informed Not Inflamed Community, we were careful with the veracity of the information and we kept politically biased statements out of the discussion. 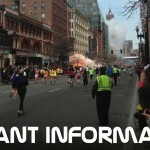 Our biggest concern was safety for friends in in the Boston area and possibly the rest of the country. I also experienced some of my proudest moments as a journalist when some of you wrote and posted to me that you either were relying on my (our) posts for your main source of news during the crisis or we were providing more breaking news than anywhere else while also being careful about how we transmitted the information. I consider it a triumph for Informed Not Inflamed. And I thank you all. But I had some mistakes too. During the hunt for the suspect, I posted too quickly about “don’t leave your house”. But I posted it without mentioning it was JUST for Boston and certain communities. Someone quickly – and I think alarmingly – asked me if this was for the whole country. Because I didn’t write specifically, I gave someone the indication we might be under a national attack. Yikes. I quickly changed that. And we also saw the gaffes outside of our online community. A number of news organizations got things wrong. CNN and the New York Post are prime examples. And there were plenty of online knuckleheads giving us such undocumented conspiracies as Obama did this because the gun bills didn’t pass. Just read a friend’s status that someone claimed that Obama staged the Boston marathon bombings as revenge for the gun vote. If you agree, unfriend me now, to save me the trouble. Even Facebook is too smart a place for you. We need to disconnect from people who are so ingrained in their extremist thinking. We won’t change them; don’t waste your energy. But we also need to stay connected to others – individuals and organizations – who make honest mistakes. Here are two good lessons. The first comes from the New York Times. This is an article that is a bit self-back patting. It was done by its ombudsman who has the job of being critical of the newspaper. In this case, the newspaper congratulated itself. In short, the New York Times Managing editor had this rule: Accuracy over Speed. It’s a good rule for all of us. But, and here’s the second lesson: let’s not praise the mainstream media too much. My long-time colleague Michael Horowicz posted on my site his incredulity of a major news organization congratulating itself by not doing what CNN and the New York Post did. I can’t find the exact post, but Horowicz put it this way: they praised themselves for not f#&%cking up. The New York Times should have the mantra of accuracy over speed. They’re not a broadcasting company; they’re a newspaper. The problem that cable news has is that they have to stay on the air all the time. Trust me, as a long-time on-camera journalist, you learn the longer you stay on-camera the bigger chance, to quote Horowicz, to f@#k-up. This constant 24/7 on-air appearance leads to some real dumb things being said or the constant themes being said over and over again. That’s why cable news is losing its credibility – and many of us are turning to social media news. But that means the responsibility of news gathering and truthfulness falls on us. The most important journalist in your life is YOU. I still believe we can trust legacy institutions to provide us with the truth — most of the time. Still, we need to be smart media consumers by remembering that even the trusted institutions get stories wrong. …there’s more than one side to a story, more than one truth. We must use the technologies at our disposal to determine which ones are accurate.